Mama Liberty and I frequently discussed the degree to which we could trust government-generated statistics, and how much of this data was faked, twisted, or fudged/nudged to meet the requirements of the powers-that-be, specifically to keep the masses happy. We both knew of the Shadow Government statistics, compared to current Departments of Commerce and Labor published data – but that was at least claimed to be transparent: the government admitted that it changed the data used to calculate inflation and other factors.. When it came to crime statistics, we frequently scratched our heads. We HEAR about crimes around the nation, and even the world, much more quickly and completely, than we did in the 1970s or even 1980s. We have virtually instant communications around the world. For example, just a few days ago, people on-line heard about four murdered people in Mandan, North Dakota hours before their families and local residents did (if they weren’t on-line). Even two decades ago, it would probably have shown up on the evening news, and the next morning’s newspaper. Of course, it WOULD have shown up in the commercial media rapidly: it might be that the Bismarck Tribune (Mandan is across the Missouri River from the state capital) would have produced a special edition or broadsheet, back in the day. But it probably wouldn’t have even made it in the top of the hour headlines or above the frontpage fold outside of North Dakota. Especially not in the big urban areas. But it might have. Why? Of course, blood and fear sell advertising – whether it is listening to, watching, or reading the news that is designed to sell that advertising. So crime has ALWAYS been exaggerated by the media. This is more true today than ever, as the old newspapers AND networks fight for their financial survival. Blood sells advertising. And of course, if that is political advertising, the threats (and blood) lead as well. “Crime is running rampant in Smith County. That’s why you need to elect me, John Jones, Sheriff. I’ll get them crooks behind bars!” Which means that as the political chasm grows between the two types of statists (liberals/regressives and conservatives/right-wingers), both sides on the “gun question” push blood more and more. To get you to buy their services – by voting for them (or against their political opponents. In our emotion-burdened, heart-on-our-sleeves society, it isn’t just the politicians and news media that splatters the blood, it is a good deal of the population that chimes in. And has the ability (thanks to both media and modern communications) to spread it a lot. There are the families and friends of victims, already terrorized by the media and politicians, who scream loudly. There are the people who either love their culture (which includes guns) or their liberties (which guns symbolize and potentially help maintain), or both. They scream back at those who attack. And are just as likely to panic, just with different results. And they ALL use statistics. Usually, government stats. A lot of the data comes from government agencies – agencies which we have great reason to distrust. Are those stats accurate? Do they reflect the truth? Or are one (or more) political groups, or the media, using them and even making them up? The above is an example of such data. Is this actually honest reporting? Was violent crime committed by blacks really half as common in 2005 as it was in 1981? 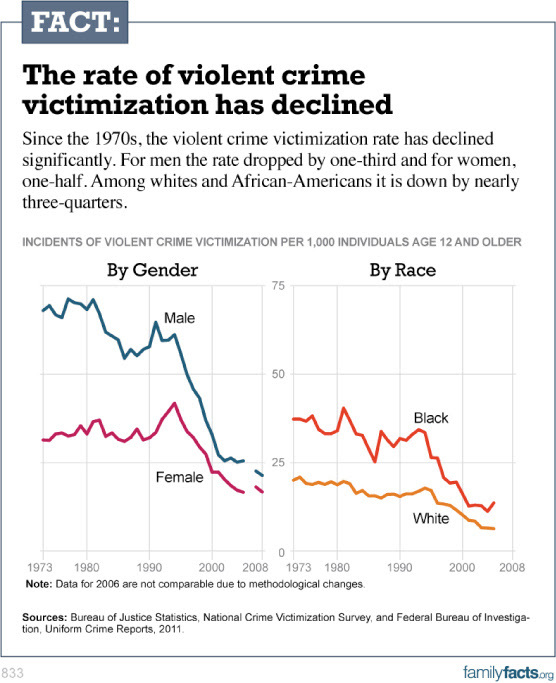 Was violent crime by males only about 1/3 as often in 2008 as it had been in 1977? Can we trust this sort of thing? Can we use this data to support or challenge other opinions? Or are we just being set up? Government, regardless of political leanings, benefits too much from high crime rates, just as media and politicians does. More crime means more demand for cops and judges and jails, which means more spending, more power, and higher taxes. If government were fixing the crime data, logically it would be to report MORE crime, including MORE homicide, in order to promote more demand for services, people, and spending. At the same time, we can argue that another reason government doesn’t cook the books is because the raw statistics don’t really matter: the media, the politicians, and the special interest groups whip up enough angst and panic to get people to push for (and accept) more government control, power, and taxes. The only reason for government types to point out drops in crime is when certain people are running for re-election to offices such as Sheriff or District Attorney. But even then, that wars with their lust for more people and more money (and more toys) to fight crime and bring criminals to justice. OF course, this doesn’t mean that we should trust government. Or NOT be prepared to protect ourselves against criminals, freelance or institutional. This entry was posted in Nathan's Rants and tagged American crime, crime, fear, fearmongering, government statistics, killing, statistics lie. Bookmark the permalink.